If you haven't been living under a rock (so to speak) you've probably heard about the Crevice Gardening craze that's swept the rock garden world. It's one of those things that are hard to ignore once you've seen one: you either hate or love them at first. Perhaps with time, you can gain another perspective... Some are repelled by the fantastic up-tilted strata. Others wonder what the fuss is all about. This was one of the first private crevice gardens built by Kenton Seth--one of the remarkable group of Colorado rock gardeners including Mike Kintgen (Curator of Alpines at Denver Botanic Gardens--who has trained a whole new generation of crevice gardeners including Adam Burch, Michael Guidi and Gayle Lehman). There are enough of these around Denver that I've actually driven by neighborhoods and seen superb examples in front yards I'd never heard about. It's a whole new orogeny going on out here! 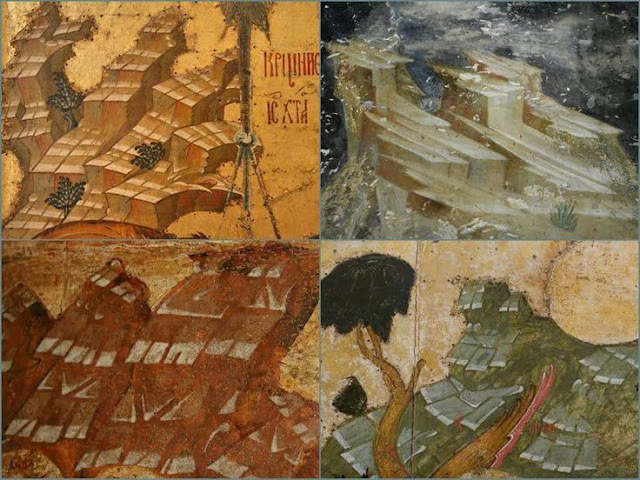 Just as crevice gardens turn timid folks off, so does Byzantine art: it's so extreme--so two dimensional, so different. As you acquaint yourselves with both art forms, however, you will perhaps notice that there are greater depths than you first suspect. The Seussian forms of Byzantine mountains don't have obvious correlatives with which to be compared to in "natural" landscapes--unless you take things like Meteora in Thessaly into consideration, or perhaps the hoodoos of the American Southwest. 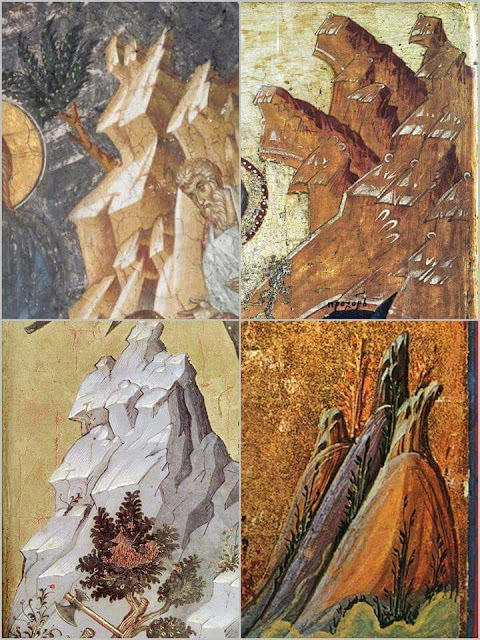 In the case of the surrealistic landscapes of Canyonlands, the Byzantine mountains are almost literal portraits! The REAL reason for these stylized landscapes of sedimentary rocks tilted towards the Heavens is to suggest the extreme ruggedness of Nature herself--the non-human world of rock and gnarly plants, like the stylized bonsai palm trees above! Perhaps what we have here is an inkling of what would one day become abstract expressionism perhaps? Of course, Byzantine art is highly structured, and seemingly repetitive. It would be interesting to know who the first iconographer who painted these stylized, sedimentary formations was and where he (undoubtedly a man) grew up. Perhaps some sandstone region in Syria or Anatolia? These outcrops don't really like the much more rugged and asymmetrical dolomitic limestone that fills so much or the Mediterranean basin. But they do maintain the symmetry of planes that Symons-Jeune describes in Natural Rock Gardening, first published in 1932 (that's almost 90 years ago!). This is considered to be a precursor to crevice gardening in its geological descriptions. Once the formula in Byzantine art was invented, it was endlessly copied. Much of the pleasure of appreciating art is to watch how these formulas evolve over time. There nevertheless seems to be an awareness of rock layers and sediments that underlie the principle of the paintings that is maintained over the centuries. One wonders any painters knew that such extreme tilting reflects enormous Geologic forces that has moves these strata to a near vertical position--a sort of God-like force to the Medieval mind....this is a stretch I admit. 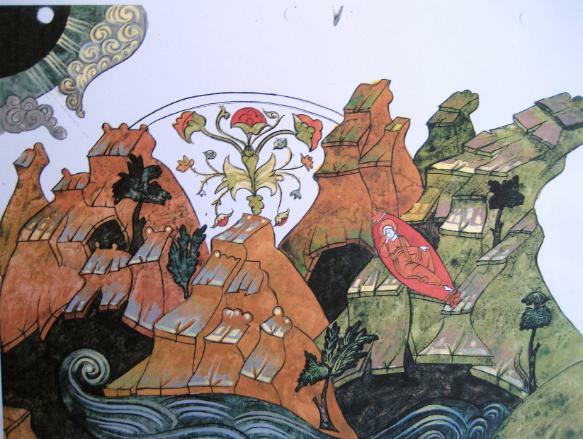 Look at the curly waves and the incredible stylized flower symbol mid-painting: we are removed from realism in Byzantine art: it is about spiritual truth rather than slavish imitation of natural rock formations. And yet the strata continue their Symons-Jeune symmetry through the aeons. Crevice gardening likewise tilts strata vertically--in order to grow alpine plants better! These too are not slavish imitations of natural rock formations by any means! 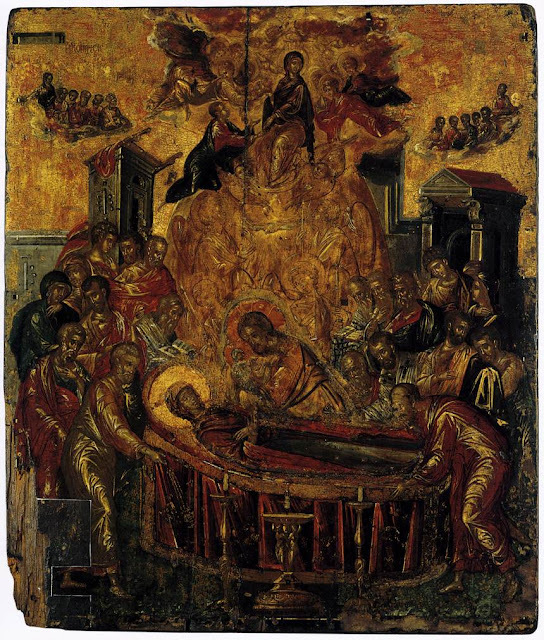 Domenico Theotokopoulos (better known as "El Greco") was of course a conventional Byzantine oconographer in his youth: there are several of his youthful icons in the Byzantine Museum in Athens. This painting of the Dormition shows strong Italian influence although very much in the Byzantine mode. The Crete where El Greco was born and grew up was a province of Venice (Crete wasn't conquered by the Ottomans until 1646--36 years after El Greco died. 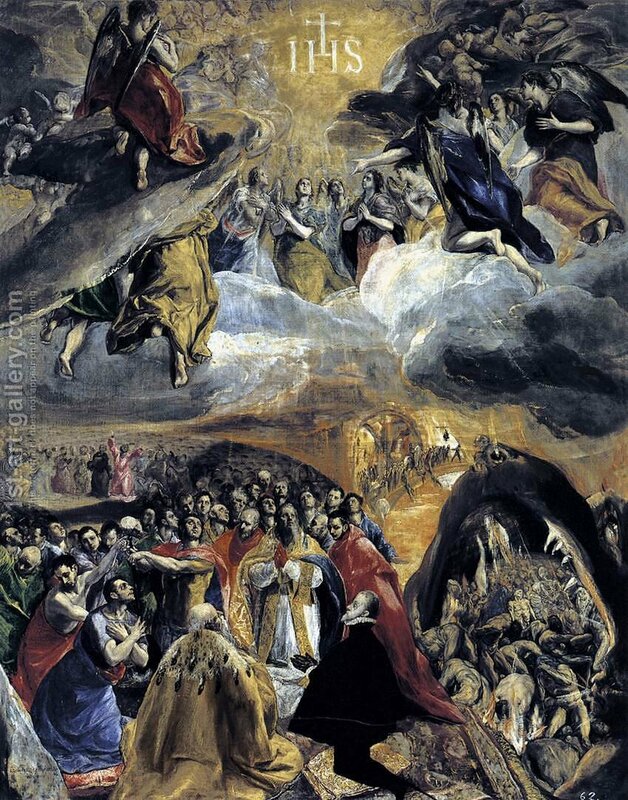 El Greco arrived at religious art a hundred years after the fall of Constantinople. He was not longer bound by the strict modes of the imperial art--but personifies the transition from Byzantine to Western Europe quite literally in his career. And El Greco achieved a powerful synthesis of the two worlds in the process. Where we see the Byzantine (and crevice gardening) expressionism appear most dramatically in the landscape painting. 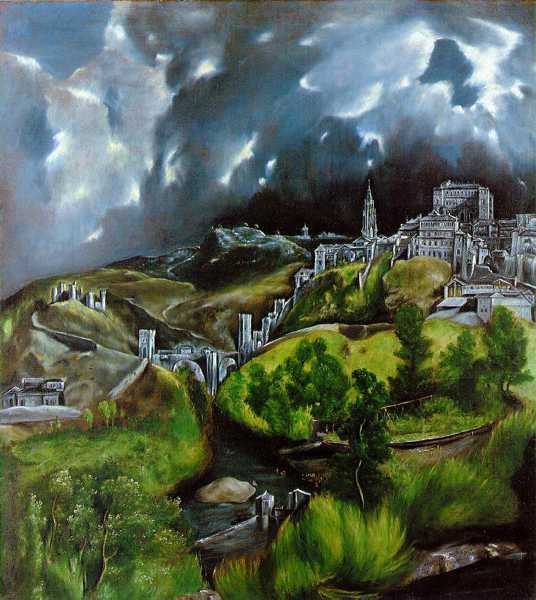 I love the emphatic clouds and the famous portrait of Toledo: so motional, emotional and demonstrative, These clouds are to skies what Byzantine mountains are to landforms: explosive outbursts of power. YOu would have to go to the Impressionists to find grasses as svelte as those at the bottom of the picture: Monet! Eat your heart out! 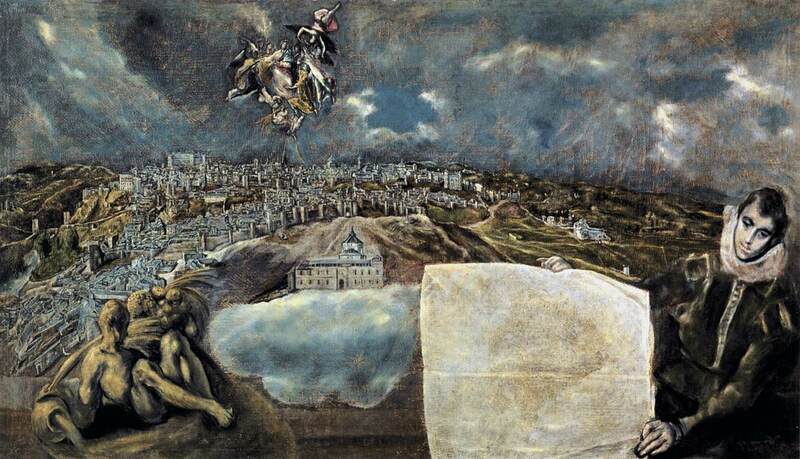 The verticality of the towers and buildings in the city depicted here (and before) carry that attenuated suggestion of spirituality that is a feature of El Greco's human portraits (not to mention most Byzantine portraiture, and those skinny sedimentary mountains!). I have always been amused at the suggestion that this attenuation was due to astigmatism, or some other ocular problem! I suppose we have to assume Goya's squat Spaniards are due to the opposite eye problem? The scene of Toledo above almost resembles a painting by Paul Klee--talk about anticipation! The little shelf the angel is perched in is as close as we get! 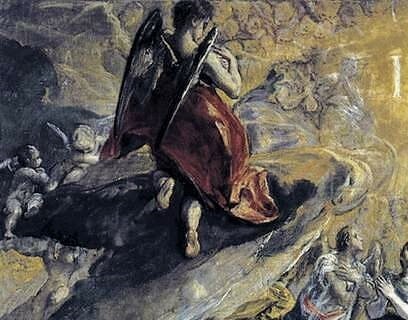 El Greco's synthesis of the Byzantine stylized tradition and the more naturalistic Italian school produced something utterly unique and different. Likewise Crevice gardening represents a sort of synthesis between traditional rock gardens, and more austere geology. They demonstrate a greater awareness of the cultural needs of rock plants--using the sort of narrow crevices that occur in geologic strata as a model. A sort of formula for success with such gardens is evolving, and these gardens have come to have a sort of family resemblance, rather like the fantastic rock-outcrops depicted on Byzantine iconography over nearly two millenia. In any case, crevice gardens are hot. They have turned out to be the very best vehicles for growing the most challenging alpines--they provide the perfect drainage, microclimates and various exposures that make growing many challenging androsaces, gentians, primulas and the other denizens of high mountains to thrive. They eliminate competition, they provide a jewel like setting for plants and they WORK. They're magical. Kenton Seth has devised techniques using pure sand that make the cultivation of dryland plants possible that we wouldn't otherwise be able to grow. It is obvious to me that the new Crevice Gardening movement is bringing about a Renaissance of rock gardening, much as El Greco brought the ancient traditions of Byzantine Art to the West and fused them so astonishingly with Renaissance painting. And adumbrating both abstract expressionism and impressionism while he was at it. Can you tell I'm a fan? 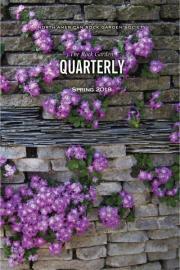 This is the cover of the latest issue of the Rock Garden Quarterly, bulletin of the North American Rock Garden Society. This issue contains articles by Kenton Seth, a large piece by Paul Briggs (with whom Kenton is writing a book on Crevice Gardening) about the great Czech crevice gardens, and many other extremely readable and interesting pieces. If you're a member of NARGS you can access this on-line at Current Quarterly (once you've signed in that is). If you're NOT a member, I invite you to join! Click here. NARGS is a experiencing its very own Renaissance with Joseph Tychonievich as editor: time to come aboard! A fresh new perspective! I love the confluence of art, rocks and plants! A fantastic read PK, nihil novo sub sole! The crevice garden orogeny is rumbling eastward - it's a wonderful time to become a rock gardener. The biggest mistake I made with my crevice garden was not elevating it. I have to bend over to admire the plants. The wall stone I used as a border seems to be sinking further into the ground each year. The border is now below the grass level. The grass keeps creeping over the stone border toward the crevice more and more each year continually needing maintenance.